Xie defends Women’s Kisei: The third and deciding game of the 20th Women’s Kisei title match was held in the Ryusei Studio at the Tokyo headquarters of the Nihon Ki-in on February 6. Taking black, Xie Yimin beat Nyu Eiko 1P by resig. after 161 moves. Both sides fought hard, and the game ended up as a large capturing race, won by Xie. This gave her the match 2-1. This is her fifth victory in a row, so she qualified for the title of Honorary Women’s Kisei (for use when she turns 60). 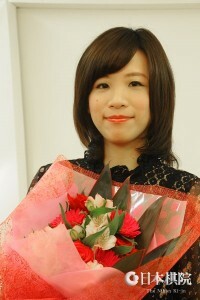 She also has earned Honorary Women’s Honinbo and Meijin titles. This is her 26th title. The 17-year-old Nyu may have failed in her first title challenge, but she pushed Xie hard (the latter won the previous four Women’s Kisei title matches 2-0), so she put up a creditable performance. She will surely be back. Yuki Satoshi 9P by 1.5 points. 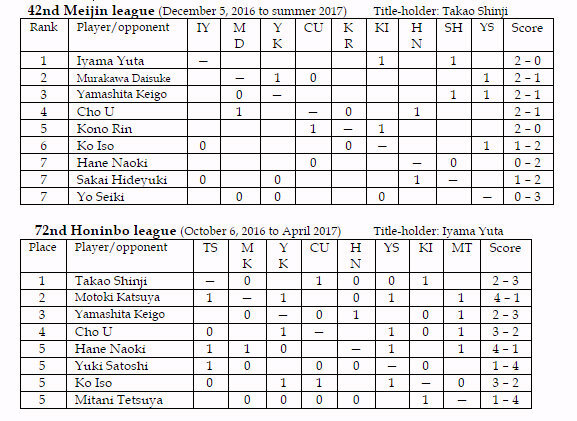 After starting out with three losses, Takao has now won two games, so his chances of retaining his league place have improved. Professional Pair Go Championship 2017: Thirty-two top players took part in this tournament, the opening three rounds of which were held at the Nihon Ki-in on February 12. In the semifinals, the team of Fujisawa Rina and Hane Naoki beat Mannami Nao 3P and Yamashita Keigo and Suzuki Ayumi 7P/Cho Chikun beat Okuda Aya 3P/Yamashiro Hiroshi 9P. The final will be played on March 5.